One of my best friend Jessica, who helps me to make my first chicken pizza. I will show you what Jessica teach me and I have implemented to make pizza. Really it’s easy. After reading this post you will also realize how easy chicken pizza recipe. There are different types and flavours of pizza in the BBQ world. Among them, beef pizza, fish pizza and chicken pizza are most popular for pizza lovers. Let’s start to make your first chicken pizza! In a small Bowl take a half cup of milk, two teaspoons of yeast and one teaspoon of sugar. Stir and mix Milk, Yeast and Sugar properly. Keep in a dry place this mixer for 15 minutes. Take another medium-size bowl to make flour dough for your pizza. Put two cups of flour in this bowl. Use salt as needed to taste. I used 1 teaspoon. Don’t forget to use an egg and two tablespoons of olive oil. Now pour yeast mixer in this bowl what we made previously. Mix flour, yeast mixer, olive oil, egg, salt and make flour dough. Don’t use water. You can watch the video how I mixed and made pizza dough. Now cover the bowl and keep in a dry and warm place for around 2 hours. Now huge time in your hand to cut Onion, Black Olive, Chicken, Red Capsicum and Green Capsicum. In a Frying Pan - Pour Cooking Oil 1 Tablespoon. I used Soybean Oil. Keep burner and temperature low at this time. Now put Ginger paste half teaspoon, Onion paste half teaspoon, Garlic paste half teaspoon and Cumin paste half teaspoon one by one. Now put chicken meat. Stir and mix chicken with spices. Use salt as needed to taste. I used a half teaspoon of cooking salt. Pour half cup water to boil chicken meat perfectly. Stir chicken and spices at low temperature. Cook for 15 minutes or as needed. This is the final step. Now In your hand, you have pizza dough and cooked chicken to take taste your own homemade chicken pizza. Take the flour dough in another frying pan. At this time keep burner off. And make flour dough pizza shape. Now decorate your pizza with the following ingredients one by one: Red Pizza Sauce, Mozzarella Cheese. Sliced Green Capsicum, Red Capsicum, and Onion and cooked chicken what we recently cooked. Put Mozzarella Cheese again and Sliced black olive. Finally, cover the frying pan. Light the burner and keep the temperature low. Within 5 to 10 minutes Pizza will be ready. Yes! After 10 minutes for me. Now our Chicken Pizza is ready to serve. 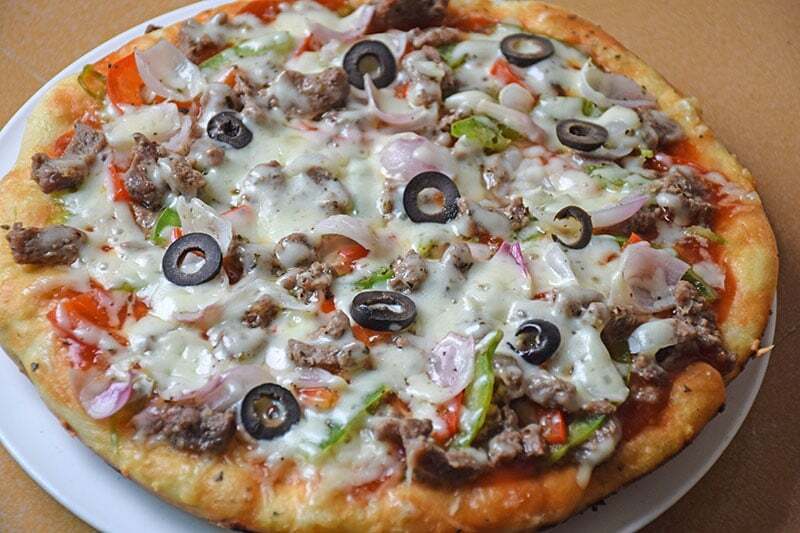 How to Make Beef Pizza Recipe Without Oven? If you have pizza dough and cooked chicken in your refrigerator you can make your pizza within around 20 minutes. Just heat your cooked chicken and pizza dough keeps in a dry place for a little time. And finally, follow only step 5. Otherwise, it will take to make around 3 hours. You can use Liquid Smoke to increase its taste. Homemade Liquid Smoke is safe to take taste. It's easy to make at home or you can collect from a store. Don't forget to try at your home. It's super easy. We encourage you to send your Pizza's image in the comment section.